Thursday dawned bright and beautiful in Amarillo with the kind of brilliant blue Southwestern sky that takes over every photo I snap. It's a nice complaint to have. 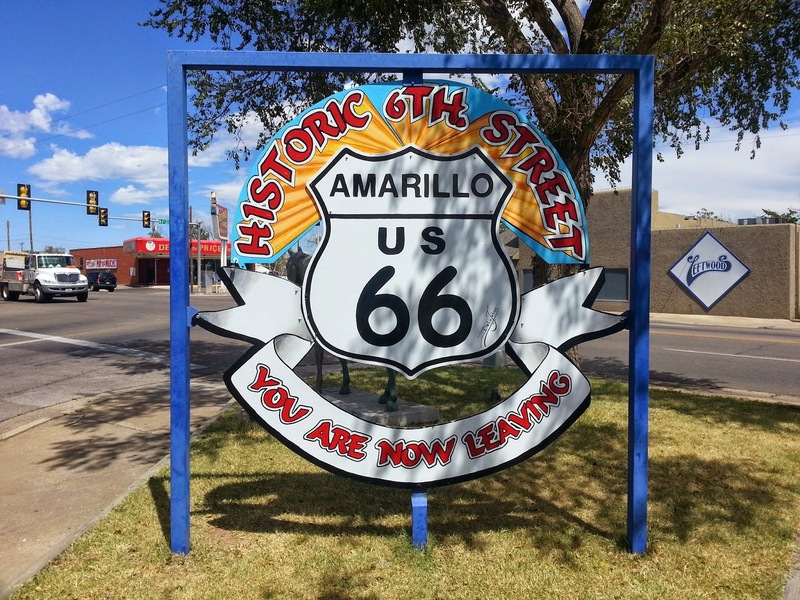 After a great breakfast at the Pancake Station, it was off for a real tour of Amarillo's Route 66 with Nick Gerlich, marketing professor, bicyclist, admitted sign geek, and Route 66 "roadologist." The first thing we took a look at was the amazing Herring Hotel on 3rd Avenue. 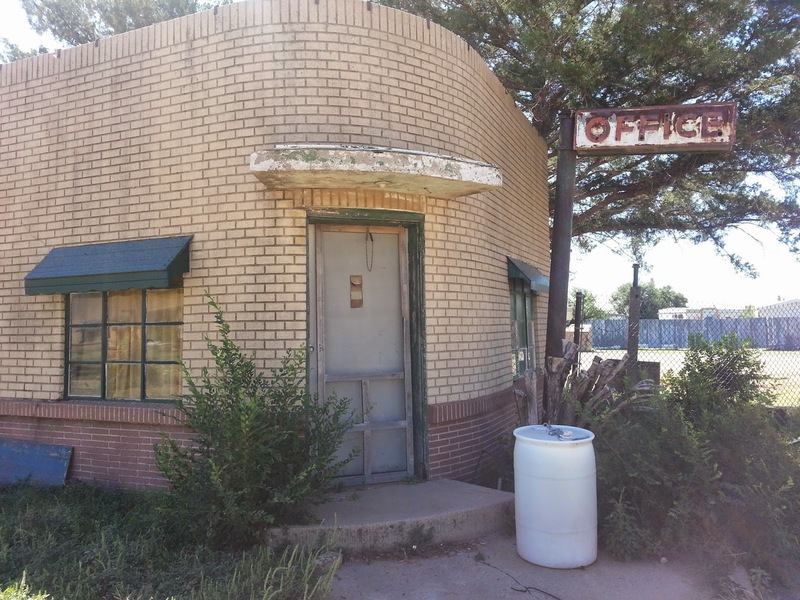 This imposing redbrick structure was built at the same time Route 66 began its trek across the country, and, like 66 itself, has been used, abused, and left to deteriorate, but is still around. 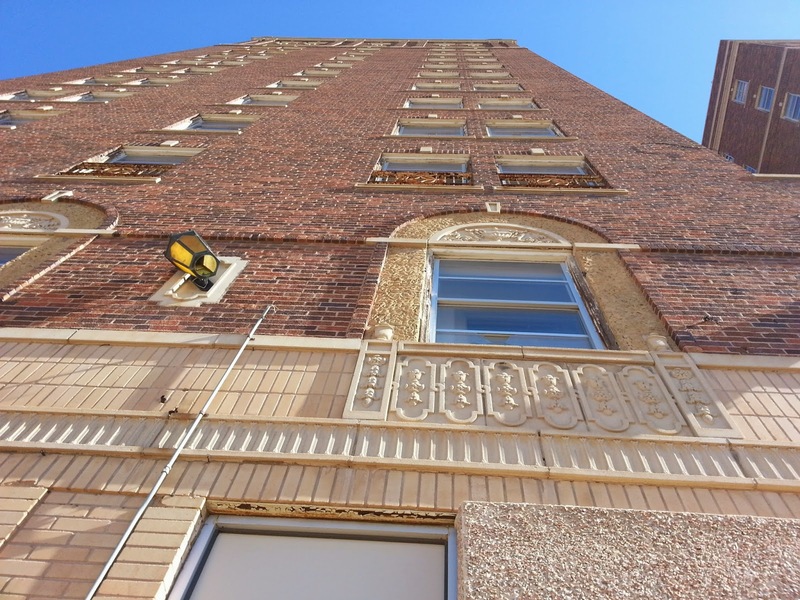 It's said to be one of three Amarillo oil-boom-era hotels built in the 1920s, but the only one left standing. It was used for government purposes during the 1970s, but has now been empty for quite awhile. We parked and walked across the street to get a close look, but when we went back to the van my mind was still so busy with details, architectural ornament, and a puzzling large space of replaced brick on a side wall that I completely forgot to get some distance photos of the whole building. So here is one of my only measly shots I took close up. If architecture and grand old hotels interest you, do look it up. Preservation efforts are afoot to save and restore the Herring, and Nick has been invited to participate in a photographic study of the exterior and interior of the building. From the Herring (I keep wanting to add "red" onto its title, but apparently that was not part of Mr. Cornelius Taylor Herring's name), it was off to the east side of Amarillo and the air base area. This is a great story in itself. Early Route 66 ran by English Field/English Airport, but as early airfields did, this one grew and grew, adding commercial airline service. Actually adjacent to English Field, the Amarillo Army Air Field was established in 1942, and after the war was reactivated as the Amarillo Air Force Base. This base at one time covered as much as 5,000 acres. 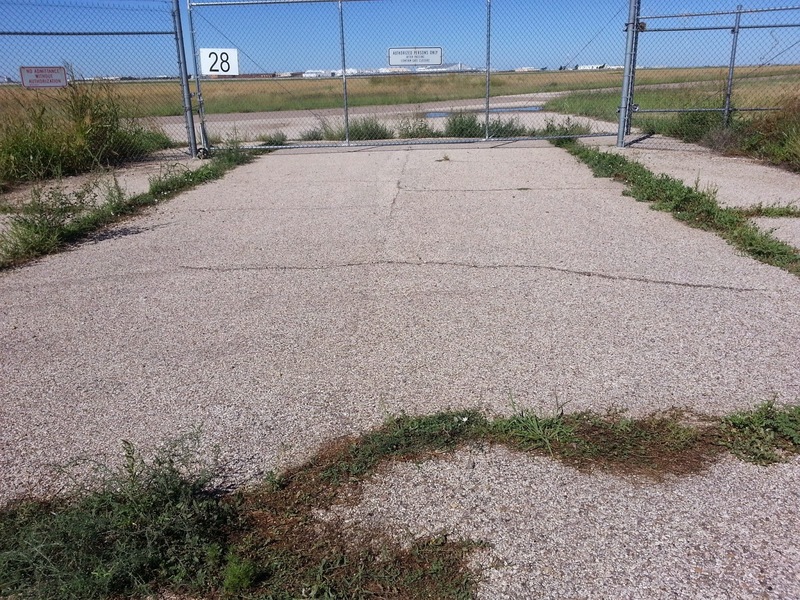 The base was eventually closed but the area is now the home of the Rick Husband Amarillo International Airport. 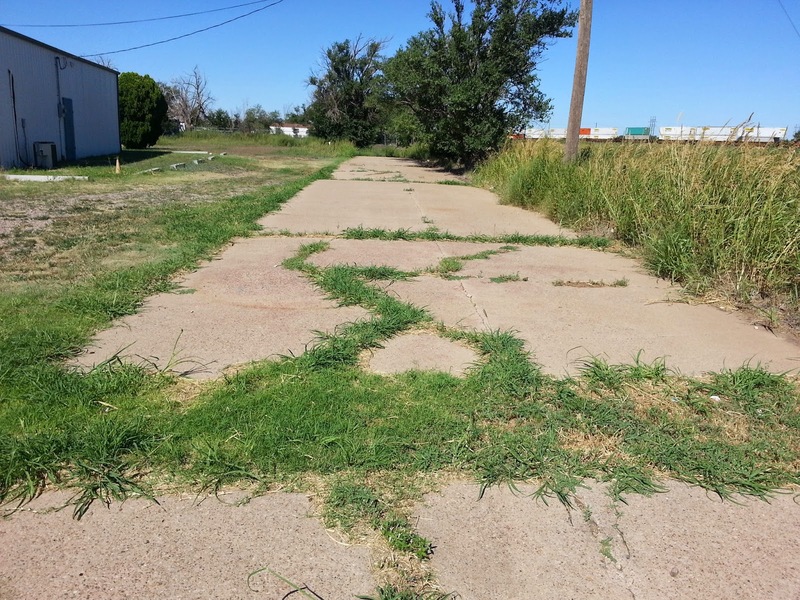 Early Route 66 was cut off by the air base, and the remnants can be seen on either side. 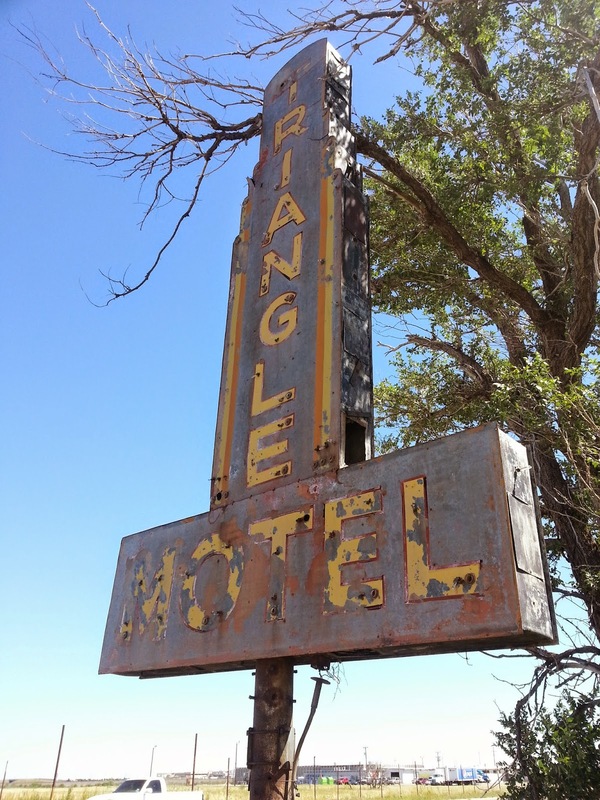 Also on the east side we visited the Triangle Motel, which must have been one classy place in its early days. In streamline moderne style with sleek (well, they were sleek once) curved corners, the units featured two rooms plus bath and covered garage each. Sidewalks and curbs outlined building sections, and a big common area between the building lengths must have been a lovely setting for visitors. The present owner, Alan, gave us a tour and told us a bit about the place. The builder of the motel complex was the mayor of the little nearby town of Borger, and was also a boilermaker - hence, the boilers still in place in the garages which heated the motel units. Alan said he has hauled 70 tons of old carpet, broken furniture, trash, and assorted debris from the motel since he has owned it. 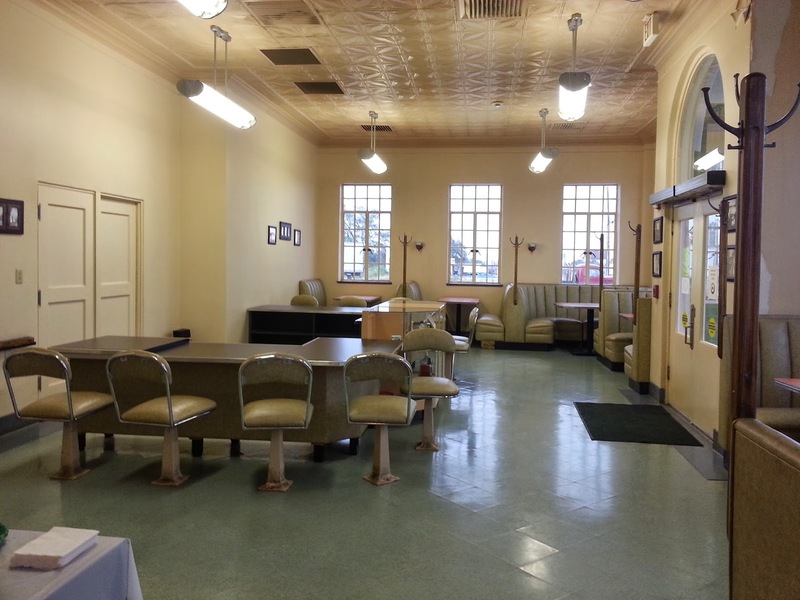 He spoke of his plan to eventually restore and re-open the place. It's still standing, and so is he, so I guess there's hope. And the signs are great. Nick showed me other sites, alignments, and great little "hidden-in-plain-sight" strips of Portland cement, far too numerous for me to remember everything and for me to share here in a half-dozen blog posts. But suffice it to say that this man knows his home turf and loves to share it. Thank you, Nick. We also took a look at the historic Sixth Street section on the west side of the city, and after Nick and I parted ways, he to actually get some things done after toting me around, I went back there to explore some more. 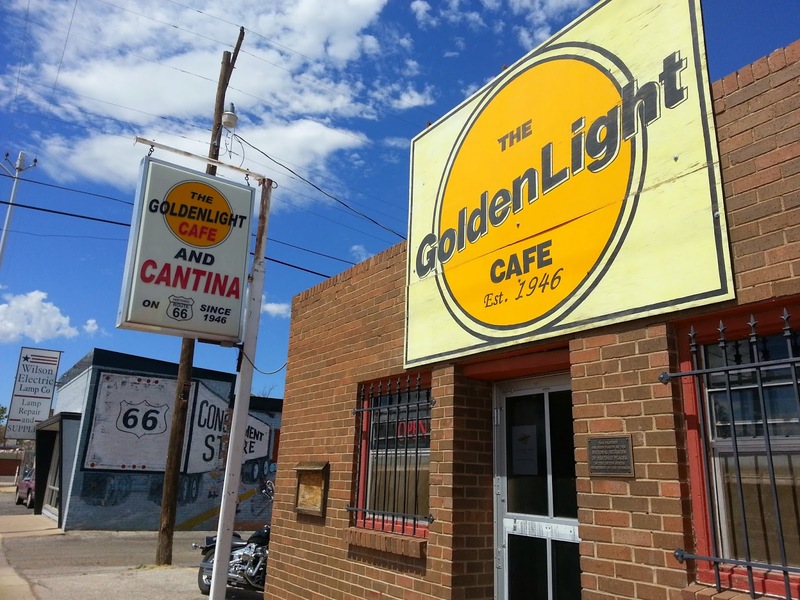 I had a quick visit with the Old Route 66 Association of Texas' Dora Meroney at her Texas Ivy Antiques shop, looked around a bit more, and had lunch at the historic Golden Light Cafe. I owe an apology to Bob "Croc" Lile, whose gallery I also intended to stop at, and I don't know if it was the lunch (very good) or my own absent-mindedness (probably), but after I left the cafe I got in the Prius and drove. Next time! Back on the highway heading east, I made a stop at the wonderful U-Drop-Inn in Shamrock. It's great to see this open and welcoming visitors. 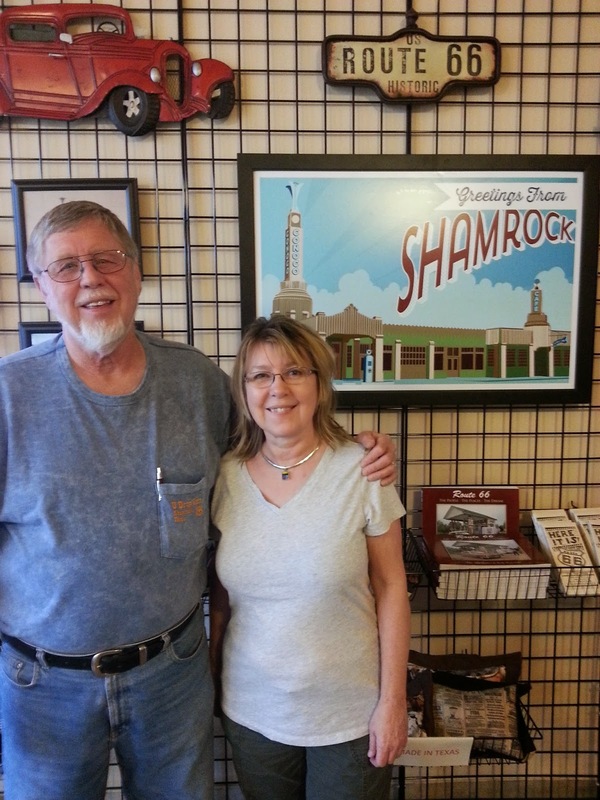 Thanks, Larry Clonts, for the coffee and visit. I've taken photos of this amazing building for years, but only got inside shots this time as it was pouring rain. So with coffee, t-shirt (organic Texas cotton! ), souvenirs, and another story for my next book (more on that another day), I was back on the road for several more hours of rain.